It’s no secret that the graduate job market is tough. There are so many stories about graduates who still haven’t found a job eighteen months after graduating. Of course, there are exceptions, but for the majority of us due to graduate next summer (myself included), the job market’s not a particularly pretty picture at the moment. So what can you do to make yourself stand out? The most obvious answer is to get a work placement or an internship in the field you want to work in. According to a report by highfliers.co.uk, 36% of graduate jobs will be filled by applicants who have already worked for an organisation as an undergraduate – which is great news! Getting a fantastic work placement is a really good way to see for yourself what working in that particular field would be like, as well as providing you with valuable skills that will look impressive to an employer. But wait a second, having an internship under your belt is all well and good, but in today’s competitive job markets, internships and work placements are becoming staple features on nearly every graduate’s CV. So what else can you do to stand out? Here are five of my favourite quirky stories about people who have gone that little bit extra to secure that all-important interview! 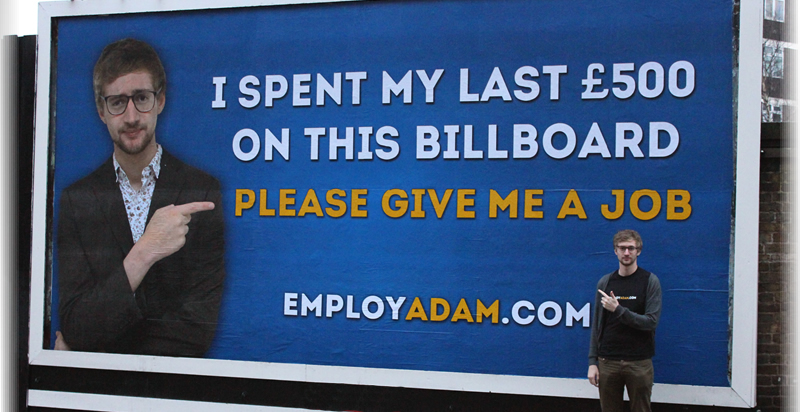 24 year old Adam Pacitti, from the Isle of Wight, became so desperate for a job that he spent his last £500 on a billboard asking employers for work. He ended up getting around sixty solid job offers and ended up with a job at KEO Digital working as a viral producer. 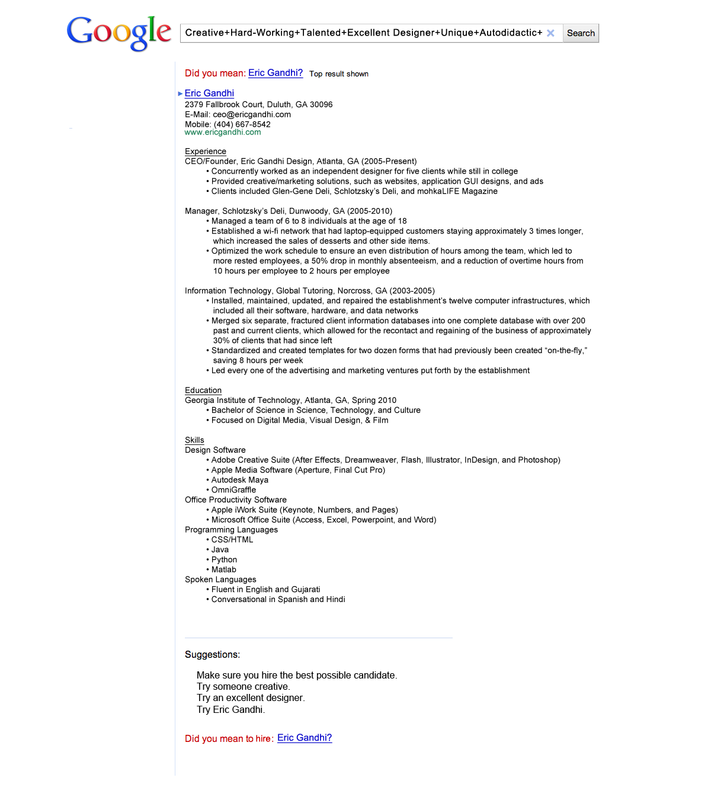 2) Get creative with your CV. On his LinkedIn profile, Eric Ghandi mocked up his CV to look like a Google search engine results page. An employee at Google spotted it and immediately recommended Eric for interview. It’s not clear if that interview resulted in a job, but it’s a great way of showing what getting creative with your CV can do. 3) Use a Google ad. Alec Brownstein wanted a job at a top ad agency, and he figured that if you’re the director of an ad agency, you’re probably going to Google yourself every now and then to see what people are saying about you. So, in order to do this, Alec launched the Google Ad Experiment, which you can watch below. When applying for a job at a social media agency, you’re probably going to have to get a bit more creative than just sending in a standard CV. And that’s exactly what Graeme Anthony did when applying for a role at We Are Social. Instead of sending in the normal cover letter and CV, he created an interactive video with YouTube annotations to encourage potential employers to find out more about him. You can find out what We Are Social had to say about it here, and watch the video below. 5) Learn to handle rejection. Chances are, before you land that dream job, you’re going to be turned down by a few companies, which is what happened to Caleb Meakins. So he set up his My 40 Days of Rejection project, which involves him taking on challenges that are deemed to be entirely unachievable and socially awkward – such as getting onto the red carpet at the premiere of Charlie and the Chocolate Factory, and giving a lecture at King’s College London. Caleb hopes that by doing things that take him outside his comfort zone, he will learn to reshape the way he responds to failure. So there you have it, some great ways to get creative when heading out into the graduate job market!